Beautifully embellished thalis and Kalash are the indispensable part of the Karwa Chauth Sargi. While the ritual includes women in their best attire with Mehendi on their hands, women pray wholeheartedly for their husband’s prolonged life. 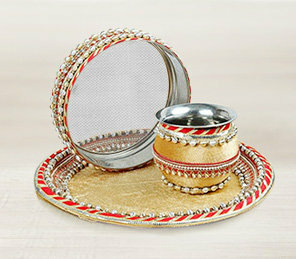 How about you make your woman stand out by gifting her an eye-catching Karwa Chauth puja thali? Adorned with your love, these pretty thalis wrapped in bandhani or enveloped in pearls are one gift, she would love to flaunt off. Karwa Chauth, also known as Karak Chauth or Karak Chaturthi has a special significance in the life of an Indian woman. It is a festival where wives keep a day-long fast for husbands is one of the most popular occasions in North India. A festival that makes everything beautiful about a marriage, it is celebrated all across the country with utmost vigor and enthusiasm. And that is why the Karwa Chauth gifts for wife and Sargi for Karwa Chauth should be special too. While FlowerAura assures some delicious Sargi Collection for Karwa Chauth, it also promises an assured delivery across India to make the occasion a success. Yes, providing you with the best Karwa Chauth Sargi gifts right at your fingertips, FlowerAura’s online gift shop near you is ready to make the moment extra special with amazing Karva Chauth gifts and make your bond with special ones beautiful, warm and healthy. Our services provide free shipping with instant delivery to make sure you grace Karwa Chauth like never before. What is Sargi and Why It is Important? A traditional Hindu Festival, Karwa Chauth reflects a woman’s unconditional love for her husband who, by her fast prays for his well being and longevity of his life. The day begins with Sargi that the mother in law offers to her daughter in law. A Sargi is prepared by the mother in law to bless her daughter with a world of good wishes and heartiest blessings. While all the daughter in law observes a Nirjala vrat (without water and food), Karwa Chauth Vrat Sargi is the only meal for the day. An ideal Karva Chauth Sargi Thali consists of sweets, savories, sevvaiyan, Suhag Karava, dry fruits, coconuts, fruits, and gifts. For such a rigorous form of prayer, she deserves to be pampered. And that is why FlowerAura is here to make each moment special. From Karwa Chauth gifts for a husband to special gifts for a wife on Karwa Chauth, FlowerAura has it all. By delivering gifts on time for more than seven years, FlowerAura has been rated 4.5 stars by customers all over India. And thus, if you’re away and can’t make it to your daughter in law place or want to convey your Karva Chauth blessings in the heartiest manner, you can send Karva Chauth Sargi online via FlowerAura’s online delivery. When is Karwa Chauth and When is The Karwa Chauth Sargi Eating Time? Karwa Chauth is celebrated in the Hindu month of Karthika on the fourth day of Krishna Paksha or dark fortnight. But the important part is to know Karwa Chauth Pooja Muhurut that has some exact durations. The Karwa Chauth Sargi Eating Time would start before sunrise: 4-5 AM. The whole duration for Karwa Chauth Pooja on the 27th of October is 1 hour and 18 mins. The timing of Karwa Chauth puja would start at 5.36 PM. The timing of Karwa Chauth puja would end at 18.54 PM. The timing of Moonrise on the Karwa Chauth would start at 8 PM. Now, with special Sargi Hampers for Karwa Chauth, FlowerAura is set to make the festival just perfect. Karwa Chauth Sargi holds a special significance as it is only after the Sargi before sunrise that the day-long fast commences. That is why the offerings of Sargi should be sumptuous and delicious. With FlowerAura’s super special collection of Sargi for Karva Chauth and its swift and prompt today delivery, is sure to take the occasion to a new level. Our special features also include making the Sargi and the Karwa Chauth fasting special by delivering cakes and flowers right at the middle of the night. So, if you’re looking for 100% satisfaction guaranteed gifts and desserts, don’t forget FlowerAura is just a click away.